Remember Who You Are is destined to transform the way vast numbers of people see themselves and the world – and it could not have been published at a more pivotal moment in known human history. We live in extraordinary times, and we face the most enormous challenge to our individual and collective freedom. David Icke has been a trailblazer for more than two decades, warning of the coming global fascist/communist state that is now unfolding on the television news and in our daily experience. He was subjected to mass ridicule and called a madman – but events have proved him right, and continue to do so. David has exposed the global network of families behind Big Banking, Big Biotech, Big Food, Big Government, Big Media and Big Pharma in book after book as his awareness has expanded – and he takes this on to still new levels of exposure in Remember Who You Are. But David goes far deeper down the rabbit hole than merely our daily experience of the ‘five senses’. He reveals the true nature of our reality where there is no ‘solidity’ or ‘physical’ – only vibrational, electrical, digital and holographic information fields that we decode into what appears to be a ‘physical world’. David calls this the ‘Cosmic Internet’, and in this amazing work he explains how a malevolent force has ‘hacked’ into the cosmic information source via the ‘Saturn–Moon Matrix’ to feed us a false reality very similar in theme to the illusory world portrayed in the Matrix movie series. 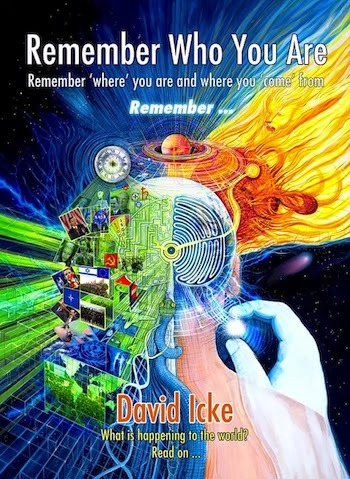 Remember Who You Are breaks massive new ground as David connects the dots between apparently unconnected people, subjects and world events like never before. Suddenly, a world of apparent complexity, mystery and bewilderment makes sense. The key is in the title. We are enslaved because we identity ‘self’ with our body and our name, when these are only vehicles and symbols for what we really are – Infinite Awareness, Infinite Consciousness. We are imprisoned in the realms of the five senses and ‘little me’ when we are All That Is, All That Has Been and All That Ever Can Be. To breach the perceptual walls of the Saturn–Moon Matrix and bring an end to mass human enslavement, we need to awaken to our true identity. Everything, but everything, comes from this. Remember Who You Are. Remember ‘where’ you are and where you ‘come’ from. Remember. "First, about the Gandhi reference in my heading: Clif High of the web bot reports/forecasts has recently (December 2011) and publicly identified David Icke as the Gandhi of our day. Clif High explains that 'they' (the e-lite) are using the same techniques on Icke as they used on Gandhi. They are as afraid of him as they were of Gandhi. They are as reluctant to kill him as they were Gandhi. They went to great lengths to assassinate Gandhi via many removes but STILL it caused their empire problems for 15 or 18 years after they did that act and they are aware of it. Clif High further explains that they fear the rise of the David Icke and Gandhi type: an individual able to harmonize with universe for reasons they are unable to understand. Such individuals usually aren't aware of their harmony; simply moving along with universe even though they will be considered fools, laughed at and vilified. David Icke is such an individual. Clif High knows this - from the linguistics as to how the people are discussing him at the minion level (the servants of the e-lite such as heads of state) and above. He found exactly the same replication of language, in the idiom of its day, about Gandhi. So Icke is in tune with universe and they are afraid to touch him. They will annoy him unendingly but are unlikely to assassinate him because of the long-term repercussions. For me, this answered a question I have heard many times, and indeed have wondered about. 'If he's right about all this, why is Icke still alive?' Many Icke fans (this includes me, going right back to his first revelatory book in the 1990s about the conspiracies, to which I responded at a visceral level, because it was the first to make any sense of the disgusting state of our world) will experience a gut-level response to Icke as 'the Gandhi of our day'. Yup, feels right. Now about this book: Icke's new book is attuned, of course. After a brief recap of his past (basically, there is nothing in his life but his work to free us), Icke dives right through illusion to decode 'reality'. As he has said so many, many times: we are infinite, eternal Consciousness having an experience in a tiny range of frequencies that we CALL the 'physical world' but that isn't. Chapter 4 addresses the 'physical' holograph, making more sense than all that contradictory mainstream 'scientific' dogma: from DNA to the electrical-plasma universe and our sun as well as the long-ago cosmic collision and reconfiguration of our solar system. Chapter 5 offers esoteric details of the genetic metamorphosis of humanity; of the hybrid bloodlines and reptilian monarchy; and of the worship of Saturn and our moon - connecting many dots, as promised but this chapter will be a real stretch for those new to Icke's reality. Chapter 6 expands on the new information from his last book 'Human Race', about our moon. Chapter 6 also introduces all-new information about Saturn, the 'master control center' as well as the Saturn-Moon Matrix, similar to the matrix experienced in the movies of that name. Some of our 'junk' DNA has been harnessed to decode a fake (holographic) reality so we remain unaware of who we really are. This Saturn-Moon Matrix drives the thoughts, perceptions and behavior of the masses as well as the 'bloodline' e-lites, who are the most locked-in because they were genetically created for that purpose. Except for the last chapter, suggesting what can be, and is already being, done about the ever-more-stifling control and manipulation of all humanity, the rest of the book mainly confronts usual themes but is also studded with revelations including the reasons/timing for the faked death of Bin Laden, the so-called 'revolutions' in North Africa and the Middle East, the earthquakes 'on demand', the real reasons for the Smart Grid technology (including Smart Meters), the end-times scam, and much much more. Yes, half the book echoes the information in his other books and his newsletters. So what? It's still valuable, it's obviously information we need to be reminded of. Otherwise universe wouldn't need to keep repeating it, would it? Icke (and Clif High) perceive the new vibrations that are already changing humanity, evolving us towards our true potential. They know that heart-intelligence is powerfully transformative (check out 'The Healing Code' by Loyd). It is as if we are toddlers right now and they are already seeing us starting to grow up. Wow! There's so much promise in all youngsters. Impossible to imagine what our world will become but what a wondrous change we're going to create together, freed from the negative controls, the exploitations and manipulations of the psychopathic e-lite! This book is a must, as were all the other Icke books, despite (perhaps because of?) the repetition factor. Those who still believe the mainstream media propaganda about Icke won't have read this far anyway. If you have read any of his other books, you will want to read this one. If you are one of the many starting to wake up: welcome friend, and you too will want to read this."